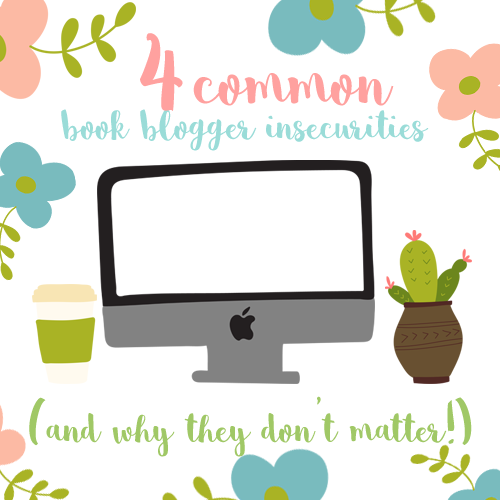 Today, I discuss things I used to, and still do, worry about as a book blogger. I’m my own harshest critic and I have so many insecurities about my style of blogging. I also discuss how I got over them. I would love to hear your own thoughts and experiences! Being a book blogger is an expensive hobby, especially when you have to shell out for each book yourself. As a new blogger, I also felt that no one would want to read my posts unless I was reviewing the hottest new releases. After all, that’s what all the big bloggers I look up to are talking about! Review copies are a double edged blade, not having them actually means you have more freedom to read what you want! Even as a new blogger, you can sign up to get eARCs with great success from either Netgalley or Edelweiss. I got quite a few off Netgalley even when I was a fledgeling blogger with 5 posts under her belt. There are plenty of other ways to access books: via the library, via trading e.g. #bookfortrades or #ausbooktrade, via borrowing from your friends. The book will eventually be released! I was so envious of everyone who read Six of Crows early – I bought and finished the book last week. Does it make me any less of an ardent fangirl? NOPE. One of my major concern when I started this blog was regarding my poor writing skills. There are so many bloggers out there with eloquent, funny, and engaging content, I was worried no one would want to read my thoughts. I especially truggle with using GIFs, and it seemed to be the hottest thing on the blogosphere when I started. The bloggers that you are comparing yourself to has their own blogging voice and identity, that’s the key to engagement. Instead of comparing yourself to them, you should experiment and try to find yours. If you want to be critical, or posts a million GIFs, or attempt at being humorous, you should just go right ahead! Do them all! See what works for you. I certainly tried everything under the sun before deciding doing lists and subheadings worked best for myself. Don’t rush it, very few people are proud of their first few reviews – you are definitely allowed to make mistakes, or be awkward, you will eventually find your stride. I can’t help you with the unicorns, though. A big key to growing a blog is regular content, while commenting and interacting with other bloggers and your readers can help establish a loyal audience. However, with school, work or other commitments to attend to – it’s difficult to balance blogging and adulting. I often got envious of bloggers who could post 4-5 times a week without a sweat, or the ones that have their posts planned out months in advance! Posts is about quality, not quantity or frequency, whether your regular schedule is once or seven times a week – you should never try and post when you are tight for time or not feeling it. Your mood and blog will suffer for it. You don’t have to sit by Twitter 24/7 to connect to your fellow bloggers. There are easier ways to interact e.g. Google Hangout. You can also time it so you are on Twitter when it’s the busiest e.g. during a #RQWN chat! Visiting all the blogs at once can be overwhelming, so do it in smaller doses of 5-10 throughout the week! This keeps you engaged in the content you’re reading. I feel that for newbies, some of the large bloggers attain almost celebrity like status. It’s even more disheartening when they don’t respond to your comments. However, thankfully, 90% of the bloggers I have come across are beautiful cinnamon rolls! Relationships can’t be built overnight, have patience my little grasshoppers. Keep engaging in a meaningful way to fellow bloggers, you’ll find your own group in due time. Trust me, I was stuck on 0 followers on Twitter for like, 3 days, at first. Time out- no unicorns? Pshhh ::finds a new blog to follow:: 😉 Also- I had zero Twitter followers for like, a solid year. And then when I got one, it was my friend’s mom 😛 I also wasn’t blogging, but still! In all seriousness, this is FANTASTIC. Because I know I am guilty of every last one of these insecurities. It is HARD. I want more time, and to visit ALL the blogs, and basically be perfect, which is not even possible. And girl, I feel you about the ARCs- it IS a double edged sword! And you know, I think #4 is SUPER important for people to remember. I was also intimidated by Faye, and Cait, and other big bloggers, but they are THE nicest people- because you are 100% right, there is a reason they are so popular, and it is because they are wonderful people AND bloggers. I feel like the bookish community is one of those places where people are actually popular for the RIGHT reasons, you know? Fabulous, fabulous post! AENTEE YOU HAVE NO IDEA HOW MUCH I LOVE THIS POST. This post is freaking perfect and even at 3 years of blogging I definitely need some of this peptalk, in particular the fear of not having enough time to blog and comment. And it was just recently I was allowed to let go and I’m so glad I am feeling better and finding my mojo! I LOVE your discussions, Aentee! I don’t read a lot of ARCs, and it’s my conscious decision, because I’m a mood reader and any kind schedule kills my mood for reading and reviewing, though sometimes I definitely feel like I’m not in mainstream because I read a lot of older books. I totally agree with your thoughts about finding your own blogging voice and identity. I think it’s crucial not to compare yourself with other bloggers but with yourself. And I’m all for quality, not quantity. Can I be a cinnamon roll????? 😀 Seriously this is such a good reminder for older bloggers too, we all feel this way no matter how long we’ve been around haha. You can be my most precious cinnamon roll!!! 😀 you veterans of the blogging world seem so zen, I am assured to know you all think the same XD! I feel like every single point in this post strikes me so deep I can’t even. This is my second try at blogging and I still have those insecurities you’ve mentioned. Mine is not wholly a book blog, but it’s all the same. What if they don’t find my posts interesting enough? Not engaging? What if? I learned to just roll with it and do what I’m best at. I don’t need a huge follower count to be a successful blogger. As long as I love what I’m doing, I’m content. Thank you for writing this post. I can relate to this so much. I have been so apprehensive to publish my blog and get into the community. I think reading this has given me a massive confidence boost. Thanks Aentee.